B.J. Taylor takes on a defender in the second half. On a night when the seniors were the ones being honored, it was the underclassmen that led the Knights to a win in their regular season finale. With the game tied at 50-50 with under two minutes to go, it was redshirt juniors B.J. Taylor and Dayon Griffin that hit back-to-back threes to give the Knights a 56-51 lead. Redshirt sophomore Terrell Allen then stole a pass and sealed UCF’s 60-51 victory against Tulane with a lay-up. Taylor had 19 points in this game to lead UCF, followed by Griffin, who had 13 points. It was a fitting end to a game, and a regular season where UCF had to rely heavily on its defense to win games. Tulane came into this game ranked fourth in the AAC in scoring, at 73.8 points per game. The Knights held the Green Wave to just 51 points in this one on 35 percent shooting. The first half was slow offensively for the Knights, but they were able to take a 27-20 lead into halftime on the back of eight points from Griffin and 11 forced turnovers. UCF came out of halftime and extended its lead to 34-22 before the first media timeout. Tulane came storming back however, and eventually took a brief 43-42 lead with 7:20 to go in the game. “It showed a lot of heart to win that game, especially when Tulane came roaring back, took the lead,” Dawkins said. Along with it being the final regular season game for the team, it was the final career regular season game for several Knights, including Djordjije Mumin, Nathan Laing and Davis. Davis, who scored his 1000th career point in this game, finished with 11 points, six rebounds and three assists in his final game at CFE Arena. After the game he addressed the crowd and thanked them for supporting him throughout his time at the university. This win clinched the 6th seed for UCF in the AAC Tournament, setting up a first round game with ECU on Thursday. 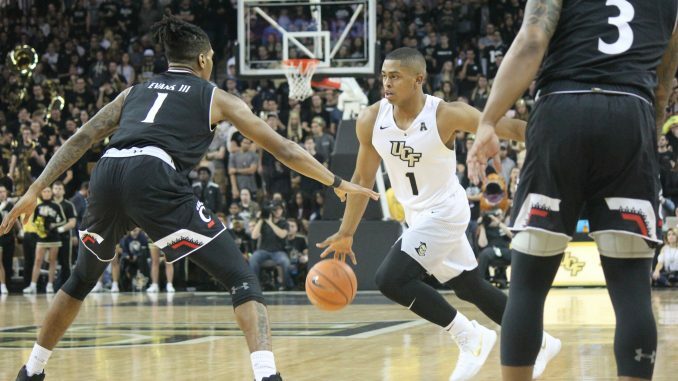 The Knights, who are projected to make the NIT by many, will need to win the AAC Tournament to clinch a spot in the NCAA Tournament.